A culture starts with the geology it sits on. For the Province of Naples in Italy, it was history of the Mediterranean repeatedly invaded by a volcano. The Bay of Naples formed a wide and handsome site on which to base a flourishing civilisation. The beautiful islands of Capri, Ischia and Procida lie just outside the extended arms of what evolved into Naples, on the north west, and Sorrento, on the peninsula to the southeast. 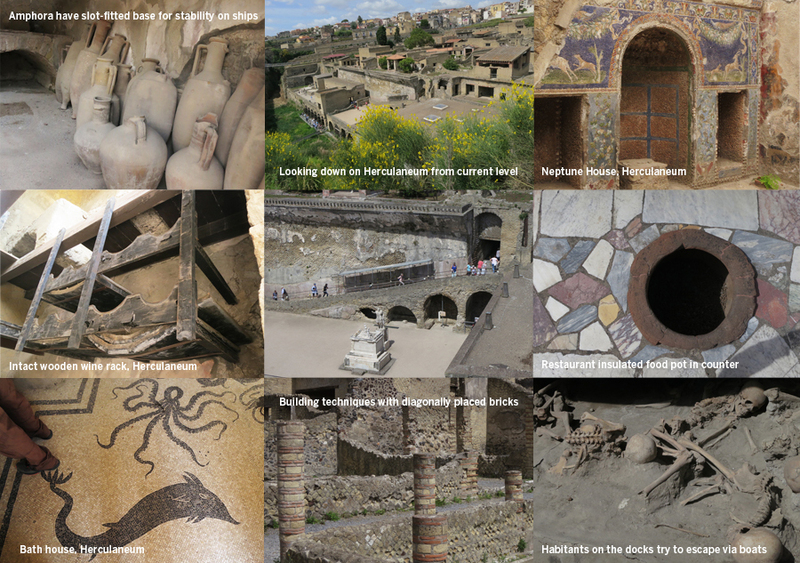 The unfortunate villages of Pompeii and Herculaneum lie in between. I spent a week here with my old friend Maureen, visiting many of the interesting spots which make up the region. We started off in picturesque Sorrento, staying in an ideally situated airbnb overlooking the Marina Grande (Casa Gilda). I enjoyed watching the mix of tourists out for cocktails or a fish dinner, as well as the fishermen. I did’t get up early enough to see them come in with their catch, but each day I watched in wonder (at their patience and undoubted discomfort on days that weren’t as balmy as when I was there) as 2-3 men methodically disentangled their nets while their little dog, and a few other guys (occasionally lending a hand) looked on. Here are a couple of views, the left from the house, the right, snacks (including a tasty sfogliatella—ricotta-filled, filo dough-wrapped) while looking out from the plaza in Sorrento. Sorrento doesn’t seem to have much in the way of monuments to visit and we walked around to see what we could see, mostly enjoying the views. The whole coast down there is composed of steep cliffs which make for two levels for the towns (as well as on Capri and the south side of Ischia): the port level with its restaurants and boats, and the level where most people (and the hotels) live. 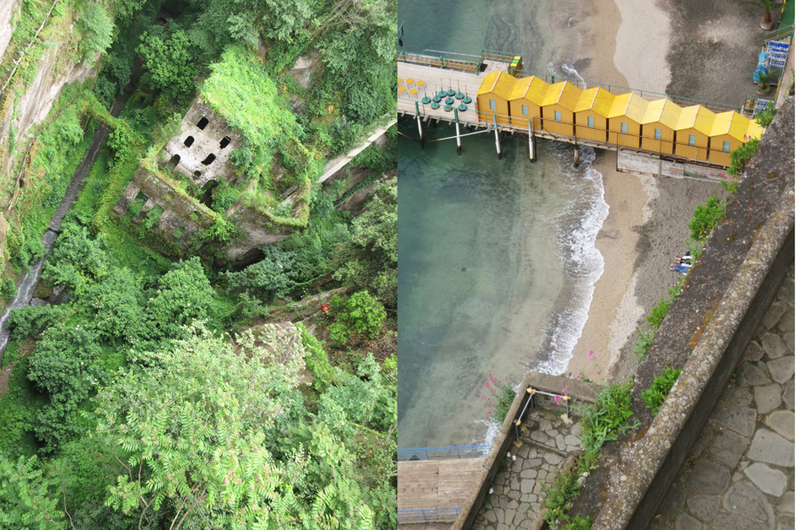 Here’s looking down onto the beach level, and looking down into a volcanically-created crevasse, once the spot where the women of Sorrento had to trek down to do their laundry in the stream that followed the canyon into the sea. 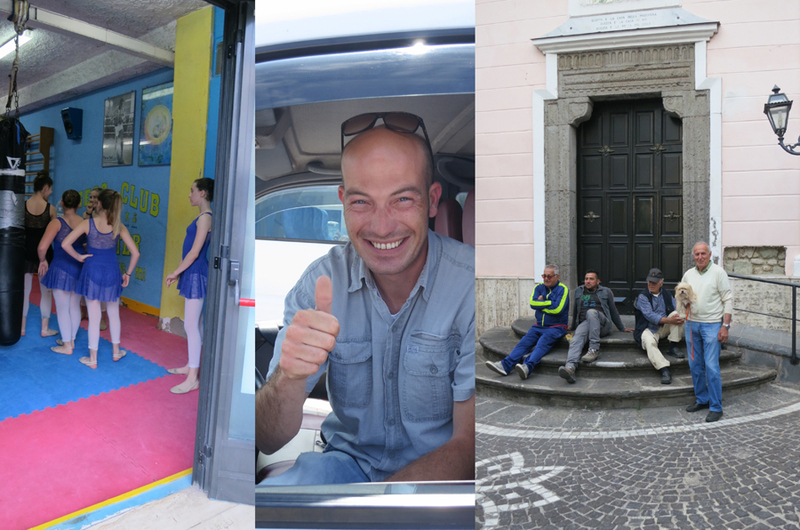 One day, we took a bus on the winding road to Positano. The bus left us off at the top of the hill, and we took the 500 or so steps that picturesquely take you down to the sea. From Sorrento, we took a ferry to Capri for the day. There are ferries available & reliable that can transport you from the mainland to the islands, or among the islands. Left photo is view of Sorrento from the boat; centre approaching Capri; right, port of Capri. From Capri, we boarded a medium sized boat (holding about 12) to head for the famous Blue Grotto on the other side of the island. This watery cave opens onto the sea with a tiny entrance, only navigable by rowboat. Our transport boat waited outside this little opening, along with many other competing tourist boats, for one of the multitude of rowboats that could ease us into the cave (we had to recline down into the hull in order to fit). Having such a small opening, it is quite dark, but somehow, the sun manages to illuminate the water from below, creating a magical glow with the Mediterranean’s turquoise cast. On our return from the Grotto, we took the funicular to the upper village, where we enjoyed a delicious lunch at È Divino. Capri was swarming with tourists, and whatever aura it once must have has been sadly compromised by the island’s conversion to a vacation’s destination spot. Nothing but expensive clothing boutiques, jewellery stores and trashy tchotchkes. Maybe visit in October? 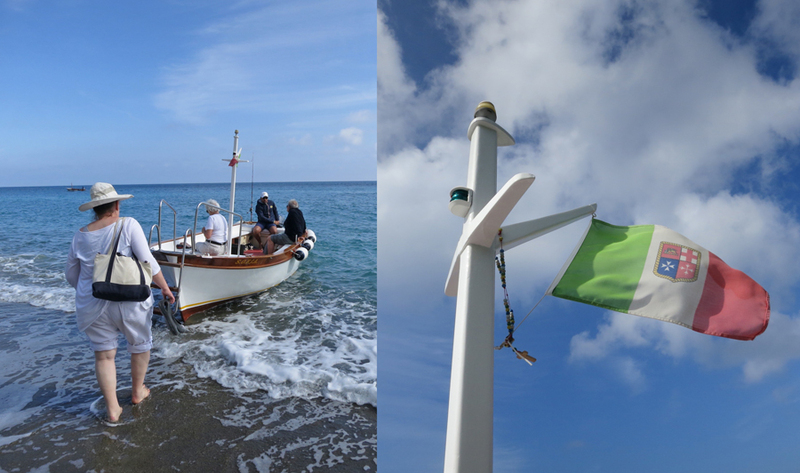 We had a completely different experience in Ischia, the largest of the three Bay islands. From the main port we took a taxi to the airbnb peaceful house a 10 minute walk from the sea, and the village of Lacco Ameno. The owner’s dad (in photo at right, with his dog) settled us in, and walked with me down to the harbour, with its famous Fungo (mushroom), pointing out where to eat, and greeting everyone we passed by name. There was a cute dance/sport gym on the road up to the house. The following day, we used the local bus to take us to the other side of the island dropping us off at the top level (as in Positano) leaving us to walk —enjoying the view on the way down—to Sant Angelo. The whole region is fragrant with the scent of lemon blossoms, and we refreshed ourselves with citrus before the hike down. There we took a water taxi (in photo 2 down) around the bend to be dropped off at the beach (part of which steams from the fumaroles beneath), where we made our way by foot up the canyon to Cavascura Spa. 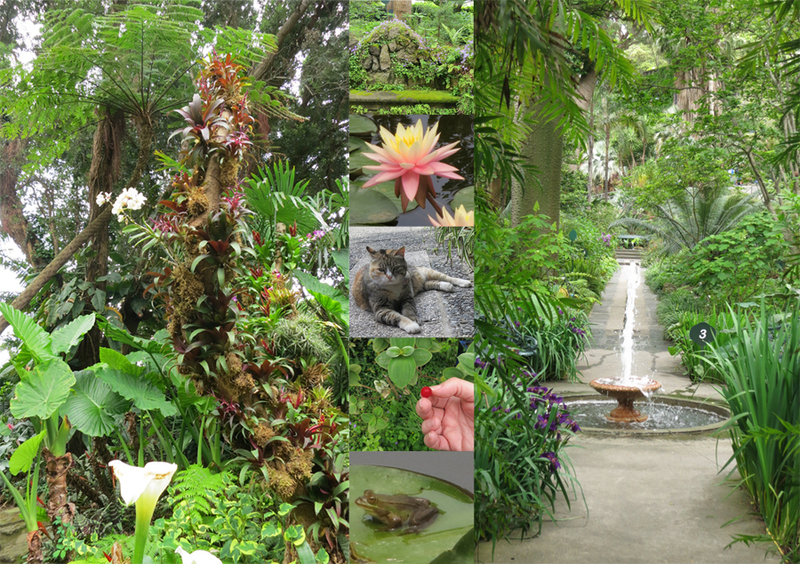 This peaceful place was nothing like the luxurious establishments I’ve seen photos of in Napa Valley (also a thermal springs zone). Small and simple, we were directed to shower, then do the sauna/ spray with the cold water hose/sauna routine before we were each introduced to our bathing cubicle. All this takes place outdoors, the spa utilizing the rock formations and carving out others to create the necessary zones. Though we didn’t take advantage of the natural clay treatment, we watched as one of the attendants carefully painted clients with the beneficial mud. Back in Sant Angelo, we enjoyed sandwiches and one of our many gelati on the beach. Looking out at the boats, I wondered about the flag flying on each. This “civil ensign”, combines the crests of the four maritime states: Venice, with the golden lion (here holding the book of Gospel, rather than the sword, which appears its military ensigns), Amalfi (white on blue), Pisa (white on red) and Genoa (the cross). I think that the best botanical garden I’ve ever visited is the Giardini la Mortella (Mortella is the indigenous myrtle (Myrtus communis), the garden created by Susana, the wife of English composer William Walton. A charming and brilliant woman, she, along with landscape artist Russell Page, transformed over the years (between 1949 and 2010, a barren rock quarry into a tranquil paradise that both provided a quiet refuge for the composer, and likewise now, for us visitors. We took a ferry from sleepy Ischia for its antithesis on the opposite side of the bay: the bustling, noisy and dirty city of Naples. Our airbnb was located in the historic centre of town and we wandered around that area that afternoon, trying to get a sense of the city. 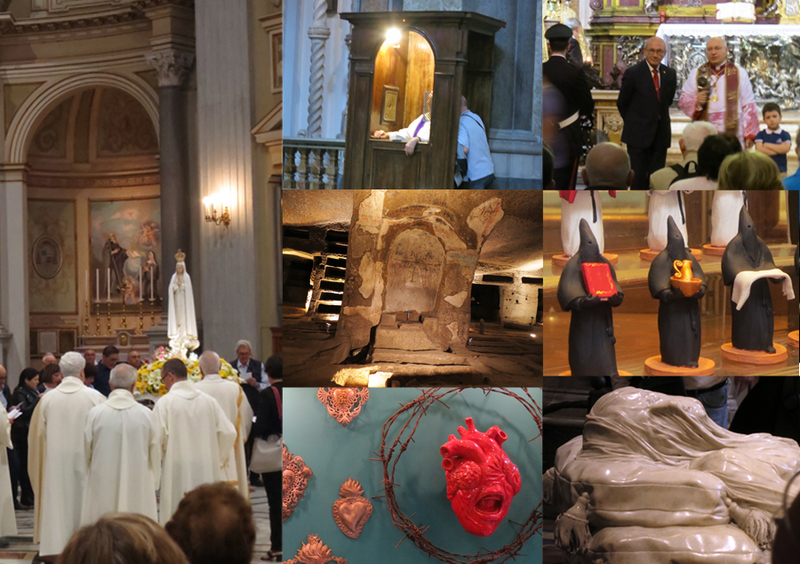 On our perambulations, we witnessed a mysterious ceremony in the Cathedral (Duomo). The priest (bishop? cardinal?) was holding up something that looked like a magnifying glass, tipping it back and forth. There was a little boy with him (‘though he wasn’t dressed up for a communion). Lots of gold and fancy robes. Later, we read about the miracle of San Gennaro, where the blood of the Saint transforms from solid to liquid (that is, unless some disaster looms—it failed to liquify in 1939, 1940, 1943—dates we recognise as bad ones, along with 1973, when Naples was hit with a cholera epidemic, and 1980, the year of the Irpinia earthquake in southern Italy. 2016 it also failed. Perhaps foreboding Italy’s new, radical government? This part of Italy is suffused with a (to my mind) violent and primitive religion. The imagery of a dead Christ (a beautiful “veiled Christ” can be seen at the chapel of San Severo), creepy KKK-looking figurines, bleeding hearts, and various tortured saints is morbid and off-putting. Maybe it’s that living under the volcano that encourages this obsession with death? Along with religion, we found other themes that kept coming up: the presence of the sea makes its navigation so important for transport and for fishing. Even the cats are comfortable on boats: we worried that someone had abandoned a cat on one, only to watch as this little guy hopped ashore after inspecting it for fish remnants. Naples is big and we made the very good choice to take the hop on- hop off bus the next day to get a better idea of the city. On the other side of town from the historic centre is Posillipo, where voluptuous mansions preside over a view of Vesuvius, the islands and the sea. Maybe that’s where the Mafioso live— there’s certainly wealth in that district. Our last day in Naples was dedicated to visits to Pompeii and Herculaneum. In late summer 79 C.E. Vesuvius covered the first with ash, the second with mud. The two vehicles of destruction meant differing sorts of remains: Pompeii was incinerated, so no organic material, like wood nor bodies remain. In Herculaneum, a resort town on the sea, we can see the charred beams on the houses, and skeletons huddle at the docks near the old shore line. Of course, no one escaped from either, as noxious fumes and terrible heat got them all before they could sail away. 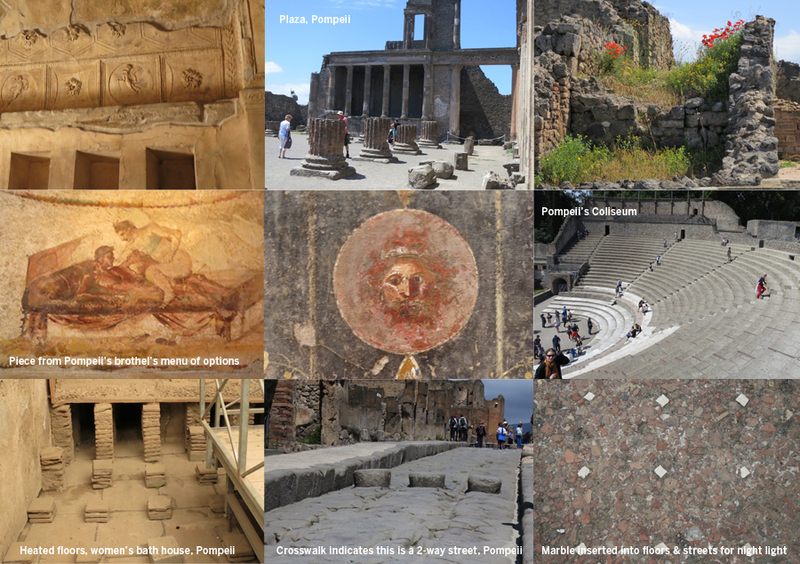 I was impressed at how modern Pompeii appears: the citizens’ apparent concern for practicality makes me see how much our Western culture has at its core the idea that humans are so clever they can manipulate nature to keep themselves comfy. The streets, with their pedestrian cross walks indicating one- and two-way, are cambered to keep the rain in the gutters. Toilets are positioned near the front door to enable flushing into said gutters. Restaurants, with their insulated pots sunk into the counters, provide refreshment. There are the wealthy, and the poor. Specialty shops catered to various needs, including carnal ones. Entertainment is provided in theatres, the Pompeii amphitheatre, with a capacity of 12,000, being the oldest such construction we know of today. Graffiti covers the walls—mostly depictions of penises, which I could comprehend without the help of the archaeologist guide, as well as political graffiti and advertisements (which needed translation). There are temples and municipal buildings too. Herculaneum is more intimate. Since it was a resort town, it is made up mostly of homes, as well as a famous library. Buried until the 18th century under 60 feet of mud, it is actually only partially recovered, as the town of Erolano sits atop the rest. Who knows what’s under there. To get to Herculaneum one must descend those 60 feet. There, we could see what had been the shore front, where the dock had been before Vesuvius pushed the sea out a kilometre. I was glad to find out that the volcano had given a warning, spewing a few inches of ash, the day before the disaster, and many people managed to flee before the big one. After returning from Naples, my head spun with the residue of the many sensations from the trip. It was extremely stimulating, and images from that place continue to haunt my mind: The natural beauty, in contrast to the forces that created it; the macho culture and the ubiquitous religion that keeps it in place; and the colourful daily life of its people. Hi Nana! It’s Lea and my mom, your drawings are fantastic – I recognized our coffee maker! Sounds very busy and fun! your trip to naples was so terrific!! wowww! thank you so much for sharing your very good moments. …..we are waiting for more😃!